Although no one likes to get up early, it will be worth it on the morning of January 5. For dedicated SkyWatchers, you’ll enjoy the pleasing view of Venus and the last phases of the waning Moon… But look closely, because you’ll see brilliant red Antares is also joining the show! 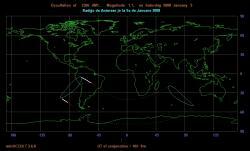 Whenever a bright star like Antares is so close to the lunar limb, chances are an occultation event is about to happen for some area of the Earth. Would you like to learn more? A photographic and scientific opportunity awaits you! Less than half a degree away from the lighted edge of the crescent Moon, Antares will make a picturesque scene for many of us that only nature can create. 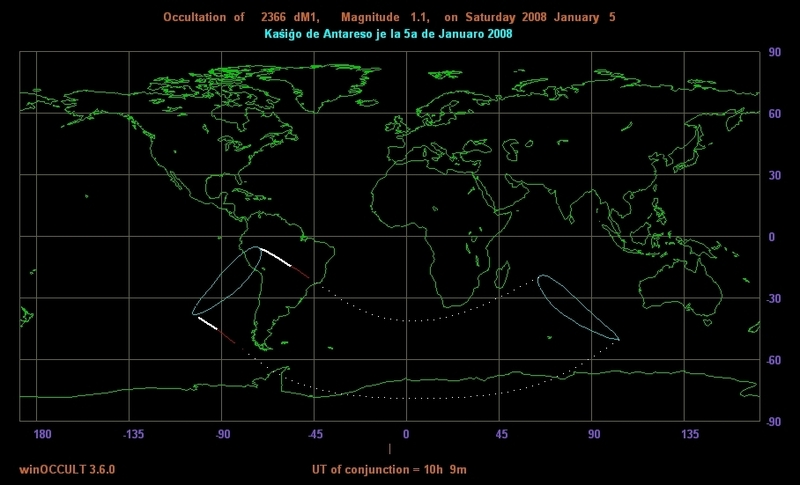 For a few lucky viewers in the south-western portion of South America, this could be an occultation event! If you’ve ever wondered about occultations, then it’s time to learn more about what an occultation is, when it happens, how to view it, record and report. Several times a year the natural progress of the Moon against the progress of the starry background means a chance to see the lunar disk occult (or cover up) a bright star or planet. If the object is bright enough, you can watch this happen with only your eyes, but even binoculars or a small telescope will greatly improve the view. What a pleasure it is to see a star simply disappear behind the Moon’s limb! But it’s not just the Moon that occults stars – so do asteroids. Occultations happen anytime one celestial body passes in front of another – a type of eclipse. For those of you who enjoy doing a little bit of science, there’s a whole lot more to do… and contributions you can make! Thanks to great folks at the International Occultation Timing Association (IOTA), you can learn how to predict, time, record and submit your observations by downloading the free ebook: “Chasing the Shadow: The IOTA Occultation Observer’s Manual – The Complete Guide to Observing Lunar, Grazing and Asteroid Occultations” available here! It’s the only book of its kind that shows observers how to get started in occultations and what equipment to use. Whether you are a novice observer, or an advanced observer with a video system, you can assist in the search for asteroidal moons, help discover new double stars and help determine the size of the Sun during solar eclipses. Let the beauty of the morning on January 5 inspire you! During the month of January you’ll be treated to great things like an occultation of the Pleiades stars on January 18 in northern North America and Northern Asia. On January 19 in southern Africa you’ll see Beta Tauri disappear. If you live in Alaska, January 20 means an occultation of Mars. For southern observers in Australia and New Zealand, be sure to check out the Moon and Regulus on January 24. To get times and locations, all you have to do is check with IOTA. If watching a asteroid pass in front of a star takes your fancy, then stop by here where you can get multitudes of information for events in your area! In the meantime, get your cameras and fingers ready. We’d like to share in your success! See if you can capture the view on the morning of January 5 and post it here. Even if you’re not able to photograph the event, we’d love to hear your reports and impressions. Watch the “Universe Today” in future months as we bring you more! Last month the old crescent Moon and Venus made a spectacular sight – hope this is even better! One minor point – it’s not the New Moon in the Old Moon’s arms – there’s a day or two more to wait for that. I guess “Old Moon in New Moon’s arms” doesn’t have the same sense of rebirth.